I know, we thought we had it so good for so long, but as the saying goes, all good things must come to an end. Or in this case, all that stuff you thought was OK to dump in the toilet, AKA the Get Rid of It Bowl, was, in fact, not OK after all. You know who you are. Surprisingly, there's a lot of misconception about what can go bye-bye down the toilet, like wipes, paper towels, condoms, drugs. None of those things are OK to flush, for the record. Zero! None! If the thing itself is made to stick together super well when wet, just say no. But when it comes to tampons, there's a longstanding misconception that somehow, because these things are cotton-ish, they are kosher for flushin'. It should be an inalienable right, but as of this writing, it is still not a very good idea. This flushability lie begins with the manufacturer, manifests in the user, and results in a problem for the wastewater treatment systems, the environment, homeowners, and is a boon for plumbers everywhere (this is even more true of wipes, but that's another headache). Tampons should be OK to flush because they are cotton, and they are designed to break down — right? Villée, who has been in the industry for over three decades, has seen some crazy stuff flushed down the toilet. ("One day, I saw a watch, a goldfish, a $20 bill, and some pot.") He says feminine care products are about 18 percent of the material that shows up in the forensic testing he's done on the stuff that comes through. But the products say they are flushable, right on the box! Villée says a huge part of the problem is that "manufacturers don't make it very clear on the packaging what the disposal methods are. I have boxes of everything sitting down in my office. Now it might say somewhere in there in tiny text do not flush or dispose of in the trash, but it's not very clear." This Playtex Tampons first-time-user guide clearly makes it seem like a matter of choice. After removing it, the website instructs, you can "Flush the used tampon or place in an appropriate waste container." Tampax's site says to "dispose into a trash can." "Just because it says 'flushable' doesn't mean that it breaks down in a reasonable amount of time," explains Lyn Riggins, spokesperson for the Washington Suburban Sanitary Commission in Maryland, one of the largest wastewater facilities in the nation. "Tampons might break down — eventually — but toilet paper breaks down so much quicker," Riggons says. "I'm talking minutes at most. Minutes." Turns out, what manufacturers call flushable is a relative thing. So is "breaks down." Breaks down, when, exactly? Hours? Days? Months? Sometime this century? In some cases, flushability according to a manufacturer (of say, wipes or tampons) literally only means the thing will make it down the toilet — it will actually go down and disappear from your line of vision. By that definition, so do golf balls, according to certain toilet maker ads. But flushability means something quite different to the wastewater treatment plant or the plumber. Essentially, it means that the item actually dissolves right away in water. This is why the big public service message in wastewater treatment these days is to get the word out about the "Three P's." Screw semantic arguments about break down time and flushability. "It's pretty simple from our perspective, which is pretty much standard industry-wide," says Riggins. "There are only three things that should be flushed: Pee, poop and paper (and that's toilet paper)." So what happens when I flush a tampon (or a wipe or anything else that isn't one of the Three P's)? "You flush them down, they go out your pipe, and into our pipe at the street," Riggins explains. That's assuming they don't get caught on anything — if they do, that's when you're calling a plumber, such as Done Plumbing & Heating in Colorado, whose Lucas Metz spoke with me about the kinds of things they get called out to handle in the Denver area. Tampons. Condoms. Wipes. "It's one of the most common things we pulled out of clogged sewer lines because of that misconception [that it's OK to flush them]," says Metz. He attributes this to the fact that manufacturers of tampons "classify themselves as flushable. It makes people think other things like that are flushable, too." But again, the only thing flushable that is not pee or poop is toilet paper. "If toilet paper gets stuck, it would dissolve pretty quickly — it's designed that way, but it's pretty much the only material that is," Metz says. "When a tampon passes through the sewer line and gets stuck on something — a root intrusion, for example — then other stuff can get stuck on it and builds around it, causing the backup." Done Plumbing guides consumers on what you can and can't flush. "The other issue with tampons is that they are obviously designed to expand, and sewer lines are not that wide — they are anywhere from two to three inches, depending on when the house was built." But assuming the tampon gets through, and plenty of them do, then what? "They end up in our treatment plants, where they go through our pumping stations," says Riggins. But ultimately, yes you read that right: It goes to a landfill — the same place this stuff would go if you threw it away in the trash in the first place. We're just creating a middle man for our own convenience, really. In a way, flushing tamps and other stuff is like NIMBY for your toilet. It's a not-in-my-backyard approach to getting rid of something that you don't want to look at, so you flush it. But someone has to deal with the some 12 billion pads and 7 million tampons are used and disposed of annually at some point, it's just a question of when and where. (And no, this isn't meant to shame women even more about their periods: As this piece points out, over a lifetime, the environmental impact of your feminine care usage may be more negligible than you think, all things considered). But that doesn't mean we can't be responsible about it. Throw them in the trash. Wrap the used tampon in something (the plastic packaging, many of which are designed for that purpose) and put them in the trash. How easy it is to do this may actually be part of the issue of why we flush all this stuff. We don't want any reminders of our waste products around us, not even right there in the trash beside us. "This stuff is used for bodily fluids," says Villée. "I've read threads on posts telling consumers not to not flush stuff like this, and the responses are pretty much, 'Dude, no way.' "
Perhaps it is a psychological thing — anything we use around the toilet seems to feel like it should go in the toilet. And on numerous threads from women polling the Internet about whether or not to flush tampons, some say it's way too gross to think of a used tampon as just hanging out in the trash for all to see. 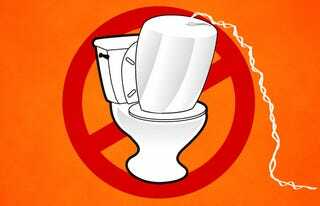 People seem to get that tampons don't biodegrade in septic systems. But even though treatment plants have adapted to deal, tampons and applicators still end up on beaches and in the environment, which is why UK organization the Women's Environmental Network stresses that it's best to bag and bin sanitary waste. And of course, manufacturers should really be the ones enduring the burden of making it clear what is actually flushable and what isn't and defining those terms in concordance with the actual treatment plants. Some advocacy groups want a global do not flush image to be used by manufacturers (at the very least) to make clear that their products are not, in fact, flushable by water treatment standards, and this would definitively include feminine care products. Others want the products themselves to be made to better standards. That has come up again and again in the problem with wipes — a much bigger headache for sanitation departments than tampons, actually, as the fatberg proved. But until that happens — and some groups are currently working on legislation precisely to that end — let's do our part. Do not flush.